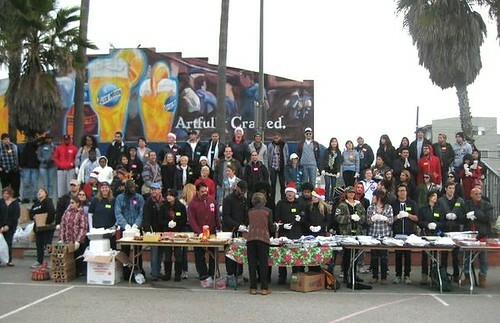 5th Annual 'Feed the Homeless' Thanksgiving in Venice! - Yo! Venice! Home Neighboring Communities 5th Annual ‘Feed the Homeless’ Thanksgiving in Venice! 5th Annual ‘Feed the Homeless’ Thanksgiving in Venice! This Thursday, November 22nd, Anthony Perez and the “sEnD mE a pEnNy” Foundation will host the 5th annual “Thanksgiving in Venice” to feed the homeless from 7-9:30am. Residents are encouraged to get involved with donations and / or help! Everyone is invited to give back in VENICE BEACH where you will be able to cook a fabulous Dish, Turkey, Stuffing, Pie, caserol etc for THE HOMELESS and bring it to The Beach for someone to enjoy. NOTE; It will also be a great time to clean out your closets and Donate clothing, Shoes, jackets etc. You will be appreciated and happy to see some accept your donation at this location. If you cannot make it to our event but would like to be involved with a donation and prayer, please go to sendmeapenny.org to donate on-line. You will recieve a certificate of appreciation and a Tax- deductable reciept if so requested. WE TRULY WANT TO THANK YOU FOR SHARING THIS EVENT AND FOR YOUR ATTENDANCE, COURAGE,LOVE,KINDNESS TOWARDS PEOPLE WHO WOULD OTHERWISE NOT HAVE A DAY TO REMEMBER.